21% of American consumers often or always bought one brand over another in the past year because it’s more responsible. Fifty-four percent of Americans say they would like to buy brands that let them support well-being and sustainability in the coming year. Globally, 34 percent of consumers often or always bought one brand over another for reasons of conscience in the past and 67 percent would like to do so in the future. Download a copy of the full study on the HavasPR website. 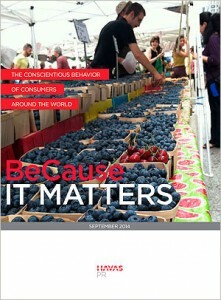 Find more information on recent trends in consumer attitudes and conscientious consumerism at the Environmental Leader. Conscientious builders and homeowners can find an effortless environmentally conscious insulation alternative with cellulose. Cellulose insulation requires no appreciable extra effort or cost over other leading building insulation products but offers an amazing array of environmental advantages. Even better, it has excellent insulating properties for improved energy efficiency and savings. Learn more on the CIMA website.